What makes the Celestron PowerSeeker 70 AZ Telescope such a wonderful instrument for discovering the night skies? Amateur astronomy can be a very fun family hobby, we probably all agree on that. However, the general opinion is that being an astronomer requires a lot of investment in professional equipment, a wide range of gadgets and study materials as well. 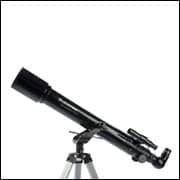 Additionally, buying a telescope like the Celestron 70AZ and telescope accessories can be trickier than one might think. But it doesn’t have to be necessarily like that, as the Celestron PowerSeeker 70 AZ Telescope may be the first device in a long series of instruments which can turn a curiosity into a sustainable hobby. Since Celestron telescopes are both affordable and highly performant as well, getting one like the Celestron 70 telescope isn’t such a huge expense. Meant for the entire family to enjoy, the Poweseeker 70 AZ telescope is advertised as one of the best Celestron products money can buy, for those who are just discovering the appeal of star watching and high quality optical instruments. Our following Celestron PowerSeeker 70 AZ Telescope review will try to give you a better idea of the product’s features and utility. Also, bear in mind that this is a different product from the Celestron PowerSeeker 70 EQ, which has a similar name. The main feature that the 70EQ and the 70AZ have in common is the 70 mm aperture (hence the use of ‘Celestron 70’ in their product titles), but there are plenty of differences that set the two PowerSeeker telescopes apart. What is the Celestron PowerSeeker 70 AZ Telescope? We cannot but agree with other professional reviewers in the field when they say this Power Seeker telescope is a budget product meant for beginners and especially families with children. Being one of the most popular Celestron telescopes available on the current market, you can make sure the quality standards of the Celestron PowerSeeker 70 AZ Telescope are met. With a 70 mm (2.76 in) aperture and two eyepieces (20 mm in focal length and 4 mm (0.16 in) respectively), this Celestron 70 telescope is meant to challenge the entire family to find celestial bodies and learn the mysteries of the universe. Concerning the technical specifications of our PowerSeeker review, it is important to mention 1.25″ Erect Image Diagonal and the 5×24 Finderscope, features you can find in almost all Celestrone telescopes. Also, the Barlow 3x lenses manage to triples the power of the two eyepieces improving thus the Celestron 70 telescope’s viewing capacities. 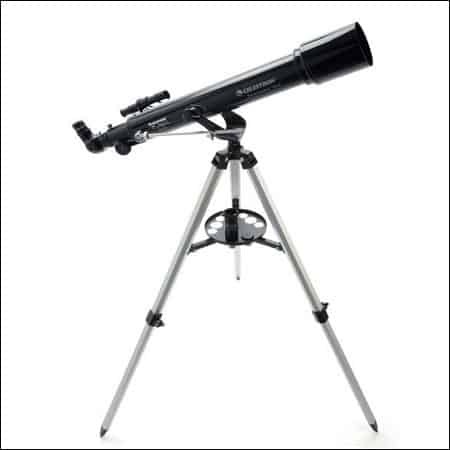 Professional Celestron telescope reviews and users’ ratings also show that one of the best tech specs of this 70AZ product lies in its no – tool easiness to assemble the entire device. In truth, you don’t have to be tech – savvy to put together all the pieces, especially if you follow the Celestron PowerSeeker 70 AZ Telescope instructions manual, but children can set up the telescope with no effort. Moreover, this telescope, like many others provided by Celestron, comes together with an accessory tray, which makes it easy for everyone to keep all the pieces together and well organized. Being a budget telescope, the viewing of the Celestron 70AZ Telescope is surprisingly good, especially when you want to look at the Moon in its entire splendor. Even if you can spot other celestial bodies, such as Mars, Saturn or Jupiter, you will see them quite small. While you can see Jupiter in quite the detail, the rings of Saturn won’t be as close as you might wish with this Celestron 70 scope. The best part is, however, that the Celestron 70 AZ telescope can be used also for terrestrial viewing, compensating thus the insufficient power to gaze into deep space and look into other galaxies or even nebulas. For instance, you an use the Celestron PowerSeeker 70 AZ Telescope to contemplate breath-taking landscapes or watch birds, among other daytime viewing activities. It’s a refractor telescope, so bear in mind that it needs good light in order to work properly, so it’s better if you take it outside the house, in the mountains, a wide field or even the desert if you can, when light is proper for star watching. Traveling to remote areas for observation becomes a habit for enthusiastic skygazers, so you don’t need to regard this as a disadvantage of this PowerSeeker telescope. The Celestron PowerSeeker 70 AZ Telescope how to use manual is very comprehensive, even if at times it uses complicated terms, but there is nothing you can’t manage if you use some online extra search. The 70AZ telescope instructions are similar to those for most scopes in its class, but you can always consult an extra PowerSeeker review from a customer for more tips and tricks. 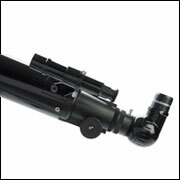 There are many Celestron PowerSeeker 70 AZ Telescope online instructions on how to assemble and use the product. The Celestron PowerSeeker 70 AZ Telescope manual is a bit complicated in terms and explanations. Where to Find the Celestron PowerSeeker 70 AZ Telescope? 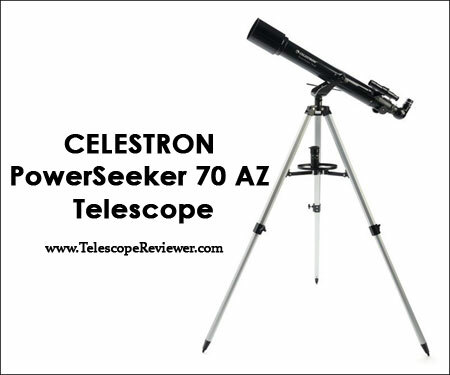 You can find the Celestron PowerSeeker 70 AZ Telescope available on Amazon. As we said before, this Celestron 70 is a budget telescope meant for first–timers, so the price is below $100. If you don’t happen to stumble upon some discounts, you can get the Celestron PowerSeeker 70 AZ Telescope for sale at $84.99 (plus free shipping). Many people bought it even for less, but when it comes to the product’s price, it is assessed as showing a very compelling price–quality balance. The users’ reviews and ratings place the Celestron PowerSeeker 70 AZ Telescope among the best sellers of their niche. 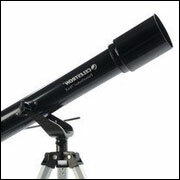 With 4 stars reviews and recommendations, this PowerSeeker telescope makes a good gift for children and adults who flirt with the notion of astronomy. The Celestron PowerSeeker 70 AZ Telescope cheap price is one of the major reasons why users recommend you to buy the product. Being as affordable as it is and showing so many great qualities, this Celestron 70 model is one of the best telescopes for beginners on the market. The Celestron PowerSeeker 70 AZ Telescope manual provides some information on how the telescope should be taken care of and stored. You can find many information online too, but as a general rule, you need to clean the PowerSeeker telescope with special microfiber cloth and keep it away from humidity or high temperature rooms. The Celestron 70 AZ telescope doesn’t come together with an extra accessory kit, but many components and extra elements are available. You can invest some extra money in filters, lenses, maintenance products, and accessories for the camera. Generally speaking, the more acessories you get, the better your viewing experience with the Celestron PowerSeeker 70 AZ Telescope will be. 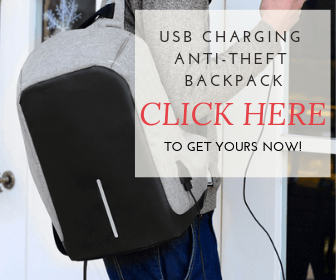 The product comes with a 2 years warranty and the company will solve some defects, making repairs and replacements due to natural and normal wear and tear. If you experience any issues with your PowerSeeker telescope, don’t hesitate to reach out to a customer service rep from the Celestron company. The conclusions of our PowerSeeker review are pretty clear. For its price, the Celestron PowerSeeker 70 AZ Telescope is the perfect beginners product. If you don’t know how much you will actually enjoy astronomy or how much money you are willing to invest in this new hobby, then this is the product for you. The Celestron 70 PowerSeeker Telescope is a great gift for children and adults who want to star gaze in some free time, but it is a telescope for the ones not taking astronomy very seriously yet. It looks and feels good and beside a few plastic elements, the product is solid, sturdy and can be successfully used for terrestrial viewing as well. To put it in a nutshell, the Celestron PowerSeeker 70 AZ Telescope is a wonderful tool for novice astronomers. However, if you are indeed serious about piercing through the night’s sky and really wanting to see what is out there, the Celestron 21037 PowerSeeker 70EQ or the Celestron 21061 AstroMaster 70 AZ Refractor are better choices in both quality and price.